I'm exhausted and energized all at once--tired from just everything (including stairs--I'm getting little mini-workouts all day long! ), and energized to see the once-blank canvas of a house becoming my home. 1. I'm thankful for watching thunder and lightening storms from the safety of my own bed. 2. I'm thankful for sunsets, and the vantage point my house offers to see them. 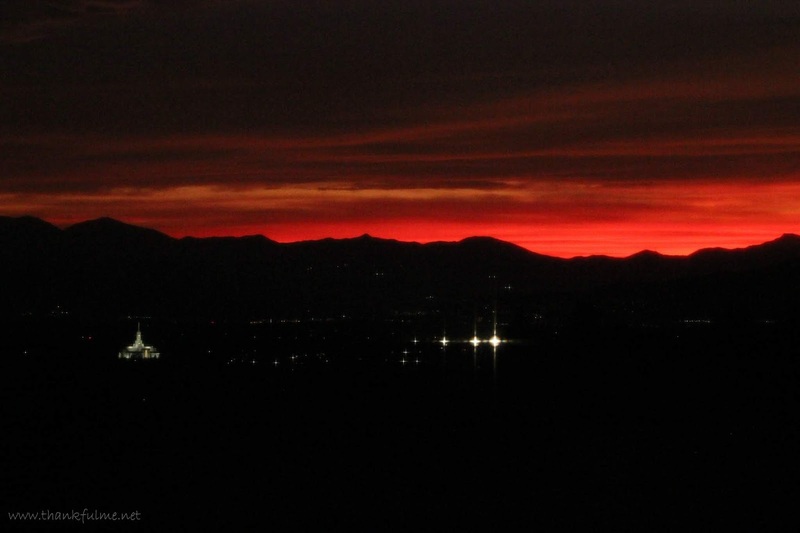 Photo: Dark mountains are silhouetted against a red sky. The Mount Timpanogos temple shines brightly on the left-side of the photo. 3. I'm thankful for my dad, who celebrated his birthday this past week. There are many things he taught me, but one that I have been pondering since seeing the rattlesnake in my backyard is how he has instilled in me the ability to not be terrified around snakes. I have a healthy respect for them, but they don't cause my heart to start thumping. Just yesterday, I told John that I had heard that there have been bobcat sightings near our old neighborhood in California. I said that if we still lived there, I would probably be chasing bobcats away from our chickens in our backyard, just like I used to chase away coyotes. Then today I saw this video, and I thought, "That grandma wins!" 4. I'm thankful I could visit with a friend this week. We met in the 1990s when we were both living in Washington. Now we both live in Utah, and it was so nice to spend some time together. 5. I'm thankful for Mr. Rogers and his neighborhood. John and I watched "Won't You Be My Neighbor" this week, and I was transported back to childhood. What an impact Mr. Rogers made, and oh, how the children (and adults) of today need his gentle ways! 6. I'm thankful for growing up in Oregon. 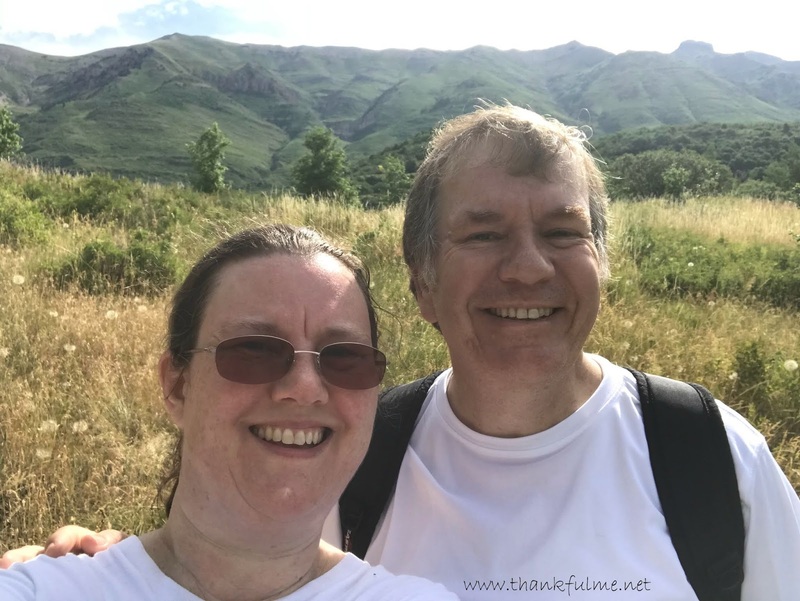 John and I also watched the movie, "Leave no Trace," this week. It's another very well-acted movie. Although my childhood home did not resemble the living arrangements of the protagonists, the movie did take me back to camping trips of my younger years. 7. I'm thankful for the growing understanding that sometimes the task for the day is not to unpack more boxes nor do yard work, but to climb the nearest mountain. Photo: John and I take a selfie with Mt. Timanogos in the (near) background. 8. I'm thankful that the terrain on the closest hike offers me glimpses of water, pine trees, and even moss--as well as flowered meadows and stunning vistas. 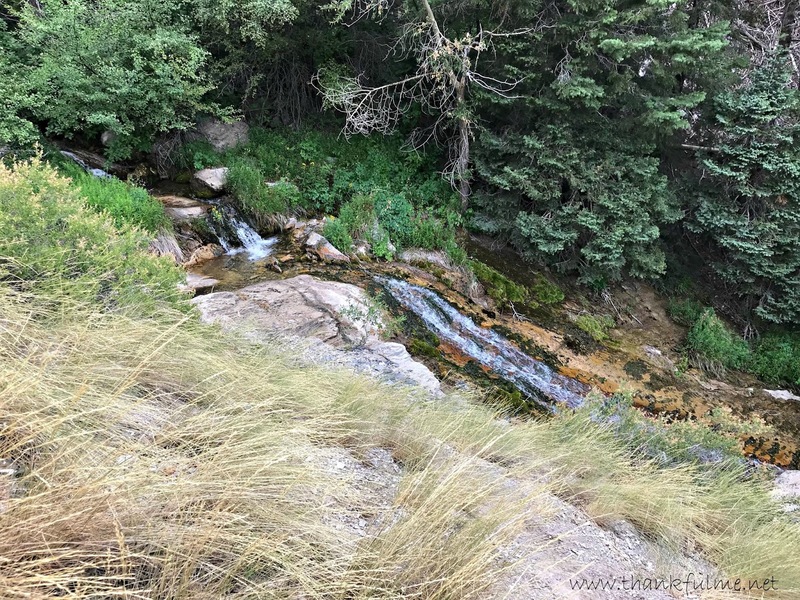 Photo: A shallow creek cascades down rocks. Green trees line the far side, and dry grasses bend in the foreground. Photo: Two orange butterflies (or moths?) land on a purple thistle blossom in a field of tall grass. Photo: A view from the Grove Creek Trail. 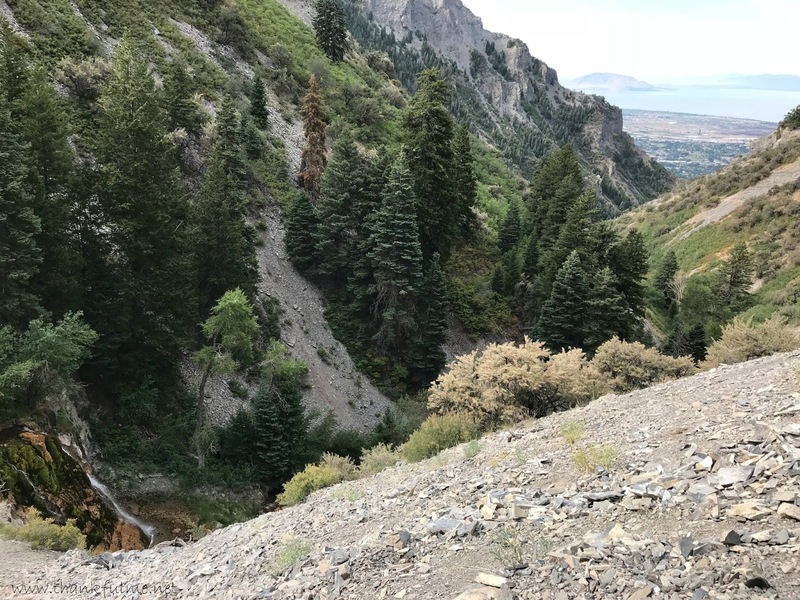 A small waterfall is in the lower left, and Utah Lake appears in the top right. A treed canyon leads to the valley. 9. I'm thankful that my oldest son and daughter-in-law had a nice vacation, and that their car was unscathed when a tree fell in their parking lot at home. 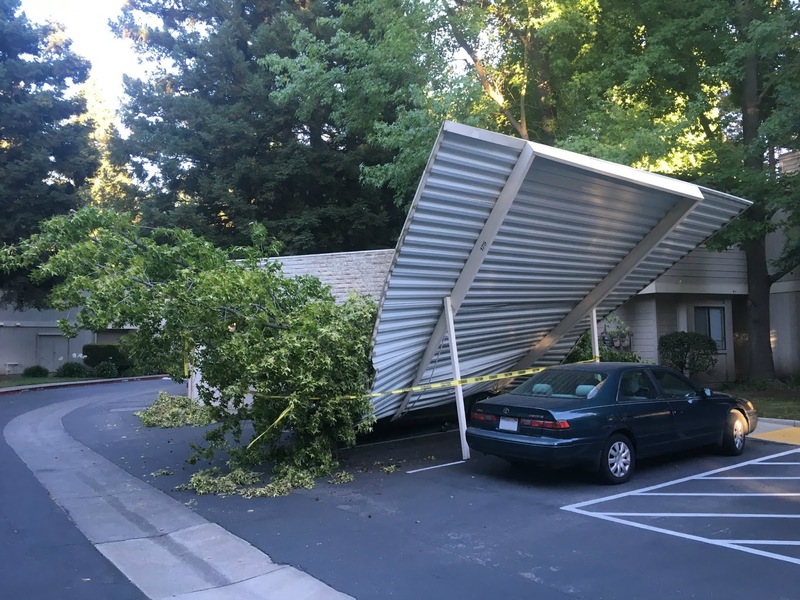 Photo: The middle of a carport has collapsed to the ground as a result of a tree falling on it. My son's car sits in the parking lot unscathed. Had the car been parked one space to the left, it would have been damaged. 10. I'm thankful for John. I appreciate the work he has done around the house this week, and also the balance he brings to my life. He's my favorite hiking partner! What are you thankful for this week? Please join us at the Ten Things of Thankful blog hop! The more, the merrier! The "once blank canvas of a home" is a poetic description. Love it. The sunset photo is beautiful, even more beautiful than I had imagined it. Oh, my goodness, that grandma strangling the bobcat! So funny, but scary at the same time! 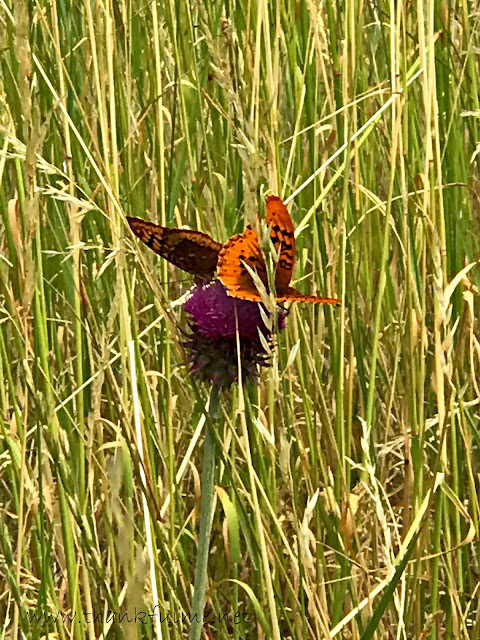 Great photo of the butterflies (moths) on the thistle. I'm glad the car escaped damage. I wonder what caused the tree to fall. I'll have to check out Leave No Trace. The sunset was really stunning! I had to grab my good camera; the phone camera wasn't capturing the reds as they really were. That grandma reminded me of a woman I knew who fell and broke her hip, but made her neighbor go inside and help her great-granddaughter finish her homework before she would allow the neighbor to call for help! I have no idea why the tree fell. I really enjoy thunder and lightening... (as opposed to a certain chodsky pes in the house, lol) but don't get to watch them so much anymore. Fortunately, Drexel is fairly "bomb-proof." The other day, though, while John and I were at the table, and Drexel was underneath at our feet, he let out one big bark. That's probably the second time in his life he has barked, and we still have no idea what prompted it. Thank you for sharing your wonderful photographs and thankful thoughts for the week. I love the outdoors, and hiking (when I can). It is wonderful you stopped unpacking long enough to take a trek. Sunsets are amazing -- and your photograph so well captured that. Good luck with filling in more of your blank canvas -- having moved many, many, many times, I know unpacking isn't always the most fun thing! Until you find something you forgot you even packed.